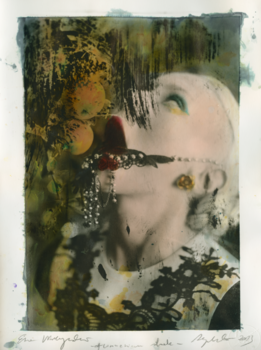 Paulina's work involves the physical manipulation of analogue photographs taken and hand processed by herself; an approach that combines her formal training as a fine art painter with her photographic practice. Countering the current age of mass produced digital photography, she embraces mistakes and acquaints us with unique 3D photographic objects, hand crafted on paper, metal, glass and other materials, often hand painted in several layers, collaged or embroidered. The results are grotesque, sublime and illusary.